Please find below answers to some of the frequently asked questions about the Alphastrut® aluminium handrail system for offshore, marine and onshore aggressive environments. Why choose aluminium rather than steel for handrails? Structural integrity and corrosion resistance are the two key properties required for handrails in offshore, marine and onshore aggressive environments - and aluminium performs well on both counts. Aluminium is a low-density, high-strength and naturally durable material. Handrails made from carefully-selected alloys match steel alternatives for strength, despite being much lighter. As such, Alphastrut handrails retain their structural integrity when struck by an external force and do not develop cracks. When anodised to marine grade, aluminium benefits from exceptional corrosion resistance. Alphastrut aluminium handrails are therefore able to cope with conditions on offshore oil & gas platforms and ships without any of the rust issues associated with the mild steel products that have traditionally been used in such settings. Is the Alphastrut system NORSOK compliant? The Alphastrut aluminium handrail system was designed to be 100% compliant with NORSOK C-002. As such, it features a continuous unobstructed top rail (with matching mid and bottom rails) and there is never any need to break hand contact. Does installation require welding and other specialist skills? No, the system is designed to be as simple to install as possible and welding is not required at any point in the process. Alphastrut aluminium handrails can be cold cut on site to suit any layout and the system is fully bolted, reducing both the time and cost of installation. How does the system handle stairs and corners? It features fully adjustable connection details that make fitting the aluminium handrails on stairs and corners a straightforward task. The top rail remains continuous and unobstructed through both elevation and directional changes. Can Alphastrut handrails be used for retrofit projects? Yes, the aluminium handrails are ideal as a replacement for corroded mild steel handrails (particularly in marine or offshore settings). A clamping system allows for a fully bolted connection to the existing steelwork, with no welding required. The Alphastrut system is also reusable, so is a cost-effective choice as a safety measure on decommissioning projects. How is galvanic / bi-metallic corrosion prevented when fixing aluminium handrails to steel structures? Fixing the Alphastrut aluminium handrail system to steel is not an issue, as we can provide isolation pads to be fitted between the two metals. What is the expected life of Alphastrut aluminium handrails? The aluminium used in the Alphastrut system is anodised to marine grade to give the best possible protection against corrosion. Extensive accelerated salt spray tests demonstrate that the handrails have a life expectancy of 50 years, even when used offshore or in an onshore aggressive environment. How often will the handrails need to be repainted? The corrosion resistant properties of the Alphastrut aluminium handrail system means it never needs to be painted. If the specifications of the project require a particular colour or the colour coding of access and egress points, the system can be supplied ready powder coated. What sort of maintenance regime do Alphastrut handrails require? The system’s design means it has a minimal maintenance requirement, with a simple visual check as part of the site’s planned inspection regime all that is necessary. The handrails have a high level of strength, so retain their structural integrity when struck by an external force. Any damage will be obvious from a visual inspection and the parts affected can be replaced. As the system is made from high grade aluminium extrusions anodised to marine grade and has proven its corrosion resistant properties in extensive accelerated salt spray testing, it will not rust like mild steel and as such does not require painting. How do Alphastrut aluminium handrails compare with steel alternatives in terms of cost? Alphastrut handrails are a cost-effective choice for any offshore, marine or onshore aggressive environment. Quick no-welding installation, a no-painting maintenance regime and the durability that gives a long lifespan combine for a life-cycle cost that compares favourably with mild steel alternatives. What form does the Alphastrut handrail come in? 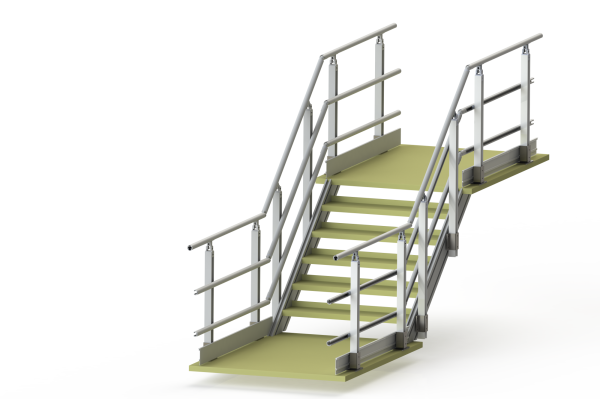 The aluminium handrail system is supplied as a continuous run or as demountable panels, depending on the specific requirements of the project. Where can Alphastrut handrails be used? Alphastrut specialises in designing weight-saving solutions for the topside modules of offshore oil & gas platforms and the aluminium handrail system was originally developed for use in offshore and marine environments. However, the corrosion resistant properties that make it the right choice there also mean it is a highly-effective option for ports, refineries, power stations, chemical manufacturing plants and food & drink processing facilities. For detailed technical information about the Alphastrut aluminium handrail system, please see our datasheets or contact us.